Several years back, sister park Cedar Point converted their stand up coaster Mantis into a floorless coaster similar to Medusa at Six Flags Discovery Kingdom. It wasn't long for rumors to pop up that Vortex would get a similar treatment to breath life into an otherwise uncomfortable ride. Vortex takes a dive down the first drop. Stand up coasters are infamous for providing discomfort to riders, especially if they aren't restrained properly (feet not exactly flat on the floor, had seen some riders ride Vortex "floorless" before whilst straddled on the rather uncomfortable bicycle-like saddle). 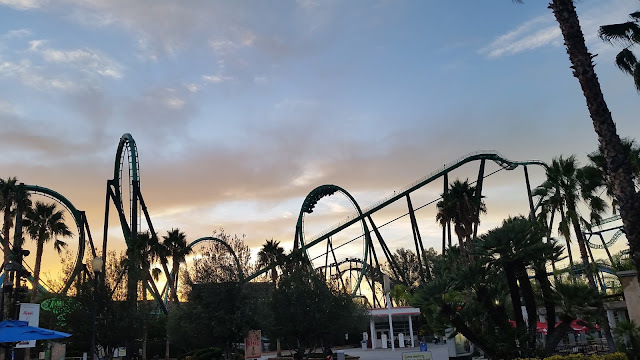 While not all stand up coasters are rough (We enjoyed Riddler's Revenge down at Six Flags Magic Mountain), Vortex has been known for being one of the roughest B&M coasters out there. Stand up coasters also appeared to be a fad that lived through the 1990s, with the last stand up coaster being built in 1999 (Georgia Scorcher at Six Flags over Georgia). the better of the 2 stand up experiences in CA with slightly more comfy trains and smoother ride. 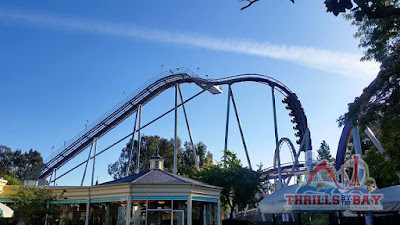 We received word from California's Great America that Vortex will get a makeover, being converted to a floorless coaster, being repainted, and being renamed as Patriot. 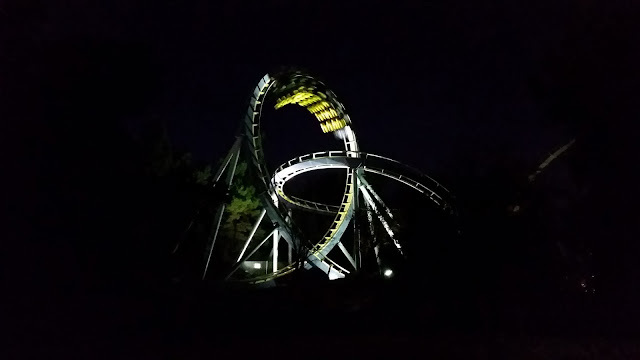 Riders will be able to get their "last stand" in on September 5th before Vortex closes for the season. The Bay Area will be the first region to feature 2 floorless coasters within less than 90 drive apart from each other, and Patriot will be the 3rd floorless coaster in California (With Scream and Medusa being the other 2, a 6 hour drive apart from each other). While Patriot will be a significantly shorter/slower/compact layout compared to its soon to be cousin in the North Bay, being converted into something that won't provide discomfort will be a welcome addition. Patriot will take riders to a 91-foot height before plummeting them into a 360-degree loop at 45 miles per hour. Patriot’s position in the park makes it a dynamic visual from three different sections of Great America. The inspiration for the coaster’s name was taken from the fact that the ride is nestled adjacent to All American Corners within a park whose name celebrates America. 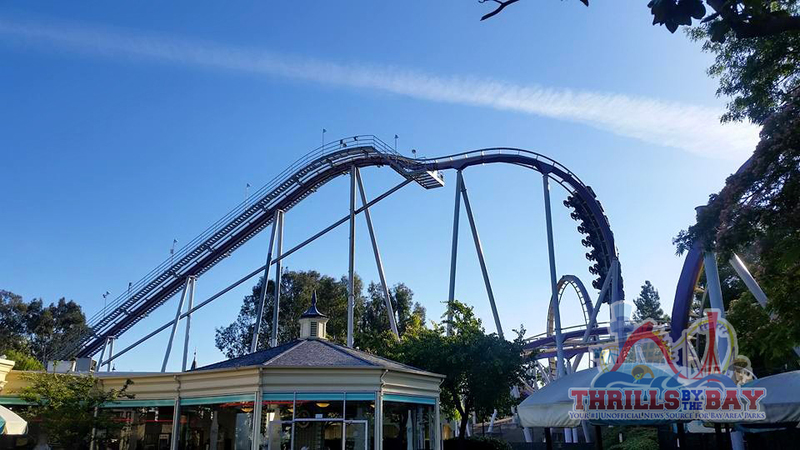 “With the track visible beneath their feet, Patriot will create unique and exciting new perspectives throughout the ride,” said California’s Great America Vice President and General Manager Raul Rehnborg. Guests can take their “Last Stand” on Vortex through September 5. Then work will begin to ready Patriot for the 2017 season. Vortex was the 2nd B&M coaster ever produced (opened in 1991), the first one being "Iron Wolf" in 1990 at former sister park, Six Flags Great America. Vortex opened in 1991. Strangely enough, Six Flags Great America added the first B&M invert that following year, Batman. A year later, CGA added the 2nd B&M invert, Flight Deck (Formerly Top Gun). Iron Wolf was relocated, repainted and renamed at another Six Flags property after it closed in 2011 and remains a stand up coaster at its existing location. Vortex, soon to be Patriot, will continue to live on as one of the earliest B&M coasters built and hopefully will provide a smoother, more comfortable ride experience. We found the name to be fitting for the America-themed park as the coaster is situated alongside the "All American Corners" of the park (also known as the "1950s area to some") and the ride's entrance is situated in the area that was once known as "Hometown Square" (Now Celebration Plaza). The bright blue will be a nice visual and refreshing to see as Vortex has become faded over the years. Vortex was originally a striking lime green track with black supports and was repainted in the late 90s as purple/yellow track with white supports. After September 5th, it's "lights out" for Vortex. What are your thoughts about the floorless conversion? We'd like to hear! Let us know in the comment section below.